It's no secret that I'm a bargain lover. It used to be so bad when I was younger; I would buy something just because it was on sale. Now I'm a little bit more critical. But overall I still enjoy a good deal. PromTimes* reached out to me to feature some of their dresses & I was impressed by their prices. I'm not getting married anytime soon so there's more of a chance of me being a bridesmaid than a bride at this point in time. If you're on the same boat as me, let's take a look at these cheap & affordable bridesmaid dresses from PromTimes. The A-line Grape Chiffon Dress retails for £49.99 or $76.83. I quite like the burgundy color & the small details such as the little flower. It's versatile in that it could be a bridesmaid dress or a cocktail dress. It's multi functional & that's a big bonus for me. I just kind of want to spin around in it & say "weeeeee." Oooh shiny. The One Shoulder Knee-length Regency Taffeta Dress is also listed as £49.99. There's something about this dress that's irresistible to me. The volume, the color, the sheen. I dig it. It has a classy look & reminds me of a modern version of something that Audrey Hepburn would wear. Now this stunning Spaghetti Strap Knee-length Red Dress is probably my favorite. It retails at £51.99 & looks as though it's worth a lot more than that. The joyful bow & delicate straps are just so alluring to me. 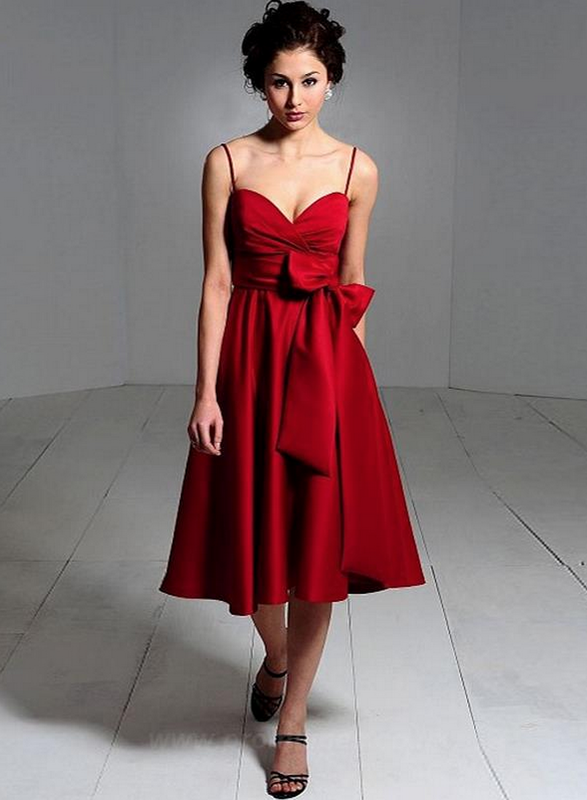 There's something very captivating about a bold red dress. It's powerful & elegant. I don't own any red dresses so this is a tempting look. Very nice selection!! I'm in love with the red one! Love the dresses, great post! Such pretty dresses! Those are some great picks! Love this post and I especially like the burgundy dress. You picked out some lovely dresses! The red one in particular is really nice. Great post. I love your picks. I used to but everything on sale too, hahaha, it's terribly and brilliant at the same time innit, the bargain bug? I think these dresses are lovely, the first one is gorgeous! Me encanta el tercero pero creo que me le pondría en otro color. I love these dresses, thanks for sharing! Have you ordered from this website yourself before? I always find ordering something online is a gamble with dresses like this, but then again it could be a total win if it turns out to look like the photo and the same material or fit as shown! I love the color and material of the dark purple one- looks like a store to deff give a look into!! I love the red dress! It looks expensive and at such a great deal! Beautiful dresses. Purple dress is my favorite. Really amazing dresses, these are some great picks you made! I simply love the red dress, I'm blonde so I would totally see myself in it! I bet that would look amazing! ¡What a wonderful post with those dresses! I'm so glad I found your blog! Those dresses are all beautiful! These are super cute! They're all a great mix of fun and classy. Great options for fall weddings. Loving the colors of these dresses!